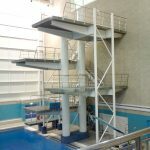 Just to challenge us the National events committee put on two events within 9 days of each other – Plymouth Diving stepped up to the challenge sending a total of 55 divers across both events. First up the novice divers travelled to Southend for the Skills finals – a mammoth team of 37 in total had already completed qualifying competitions and were determined to enjoy their National event. Plymouth won a total of 4 medals – beating last years total of 1 so a big improvement overall. Lucy Gutierrez took Gold in a really exciting Girls 11 years competition with a score of 314 beating the silver medallist by 14 points. 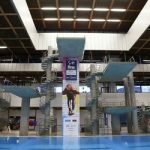 In the boys 12 years event Alfie Westerman took silver and agonising 0.6 behind gold after a slightly dropped last dive but still scoring 328 points – huge! In the Boys 14-16 years we took two medals, Corben Gibbs was second with 301 points and Adam Nelson third with 293 points. Both massive improvements for the boys. 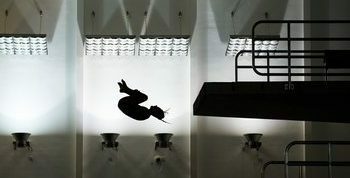 At the National Age Groups the team were trying to emulate 13 medals from last year and came up just short with 9 but the level of competition has risen once again with some very tough competitions for the divers. Top diver of the week was Connor West in the boys 14/15 years category, who picked up three Golds (Synchro, 3m and Platform) and a silver in the 1 metre. This was a fantastic improvement from last year and is our best ever result at this level. Connor’s synchro partner was Harry Mason who also picked up a bronze from the Boys 16-18 3 metre. Summer Radcliffe in the girls 10/11 years category won Gold in the 1 metre event and some near misses in her three other events. Aimee Fishleigh and Shana Vallance took the girls synchro bronze medal which was a fantastic result for them and they each came close with their other events with a 4th place each. Josh Hughes hit bronze at the fourth attempt after a weekend of up and down diving, he finally found his feet on the 1 metre in the boys 14/15 years category. Tommy Davis also took a bronze in this category but in the platform event, another fantastic result showing great improvements. Mister Unlucky was Euan McCabe who recorded two 4th places in very tough events.